I’m going to let you in on a little secret…I can be pretty loud. I laugh loud. I burp loud. I can worship loud. One might even say there’s a bit of “fire” in me. And I used to have this idea that having a gentle and quiet spirit meant that my personality had to be gentle and quiet. Oh how I used to wrestle with this! I had a difficult time reconciling the above scripture with my passionate, outgoing self. I felt doomed. Doomed to never be able to achieve this thing that God finds so valuable. I didn’t understand that having a gentle and quiet spirit is about the position of my heart and not the volume of my laughter. It’s not a personality that someone is born with, it’s a trait that must be pursued and developed. It’s about having a soul that is at rest. 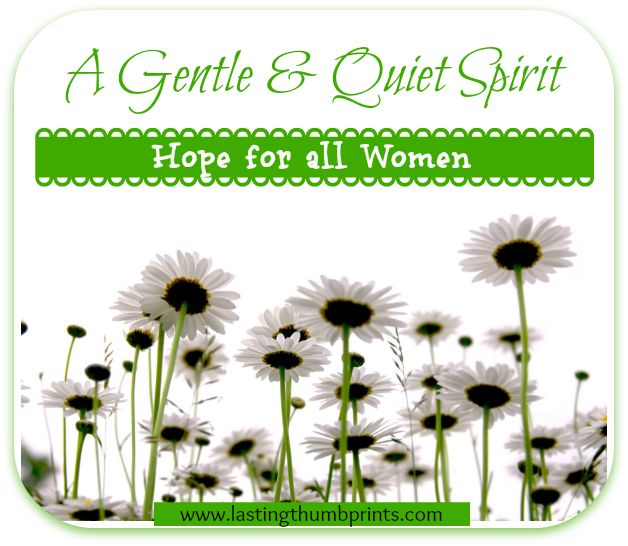 I learned that a gentle and quiet spirit can only be achieved by putting my hope in God (1 Peter 3:5). It’s not something that I can be develop apart from Him. I can only do it by being in relationship with Him. It’s about allowing the grace and love of God to flow through me and not being ruled by my emotions or thoughts. It can be seen in my response to the storms of life. It can be seen in my response to others. So whether you are a naturally loud or quiet person, know that there’s hope for us all! This inner beauty that is precious to God can be yours. I’m sure I will spend the rest of my days developing in this area, but it’s something that I’m striving toward. I want to model this for my children. This is the legacy that I want to pass down to them. I really enjoyed that. I, too, am a loud person, I laugh loud, I talk loud at times, but I react loud even more. And I’ve been daily working on (and struggling) at reacting and behaving quietly. Thanks! I’m right there with you, Stevie. It’s a discipline that I find myself working on daily as well.